A Whitewater Rafting, Zip Line or Sky Trekking Bachelorette or Bachelor Party is a unique alternative to the conventional bar crawl. Get your crew out of the city for the Colorado adventure of a lifetime. Conveniently located just 30 minutes from Downtown Denver, the Colorado Adventure Center is the perfect addition to any Denver Bachelor Party. Half and Full Day options allow your bachelor/bachelorette party to enjoy a whitewater rafting or zip line adventure and still have time for the traditional Denver Bachelor Party festivities. The Colorado Adventure Center works with a variety of transportation companies to ensure your bachelorette or bachelor party can safely enjoy your adventure and a take advantage of some of Colorado’s famous breweries on the way back to the city. Does your Bachelor/Bachelorette party want to stay high and dry? No worries! Get your party’s thrills in on our 8 line high tower zip line course or put your skills to the test on the brand new Colorado Sky Trek. Brides & Grooms Play for Free! Bachelors and Bachelorettes free with parties of 10 or more! Call now or fill out the inquiry form to get your Bride or Groom’s adventure for free. The Colorado Adventure Center offers beginner, intermediate, and advanced levels of whitewater rafting on Clear Creek. Whether your bachelor party wants to kick back on the beginner section or get the adrenaline pumping on the advanced, we’ve got you covered! 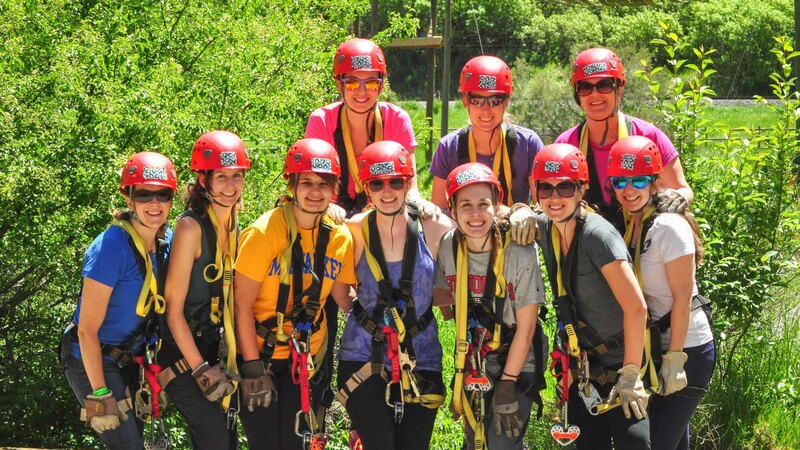 Package Whitewater Rafting, Zipline, and The Colorado Sky Trek together for a full day of Bachelorette Party adventures! Bachelor Party on a budget? Don’t worry about breaking the bank! We offer great group discounts for Bachelor and Bachelorette parties 10 or more. Have you been put in charge of planning a bachelorette or bachelor party in Colorado? Planning an unforgettable adventure for your pre nuptial celebration has never been easier. The Group Sales Agents at the Colorado Adventure Center will help you find the right adventure for you crew, set up transportation, and will even set up an after party at one of the local breweries. Don’t want to pay the bill for your entire bachelorette or bachelor party? No problem! Set up a reservation and let the rest of your party call in individually to pay. Call 1.877.947.7238 or Request Info today to get your crew on the adventure of a lifetime!